Watch as Davison’s Better Way to Invent turns Diana’s Chilly Mat idea into a store-ready reality! It was a mid-summer electricity outage that pushed Diana, a Georgia mother of two, into action with her idea. After work one day, the self-proclaimed pet lover walked in on her beloved miniature dachshund, Ripley, panting and dehydrated. Frustrated that there were no products on the market to help him, Diana knew she had to find a Better Way to keep pets like Ripley cool and safe in any condition. Watch as Davison’s Better Way to Invent turns Diana’s Chilly Mat idea into a store-ready reality! The summer heat can prove to be too much for pets which left Diana Edington frustrated because there weren’t any cooling products on the market that could keep her dogs from being parched and panting. 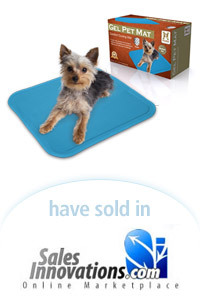 So, Diana took matters into her own hands to find a Better Way to keep pets cool with her chilly mat idea. After Davison’s help designing her product, it has since been licensed by Hugs Pet Products and has sold at stores like Petco and Bed Bath & Beyond.